This former Safeway store closed in 1999. It looked like this in May 2017. 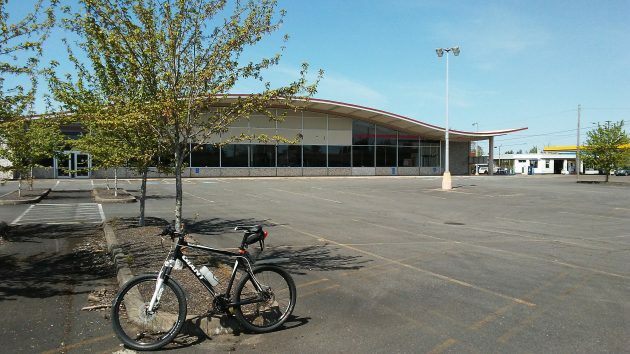 The former Safeway supermarket in West Albany has been vacant for most of the last 18 years, and now the owners are negotiating with a potential new tenant that would put the property to a new use. It won’t, however, be a grocery store. Signs that the property was for lease disappeared in recent days, raising hopes among passersby that something might be going on. There is, I learned from one of the owners, though exactly what he was not at liberty to say because negotiations are still going on. The Kampfer family, which started in the meat business in Albany and once ran a string of 16 meat markets along Highway 99 from Salem to Medford, has owned the property at 635 Pacific Blvd. since the 1940s. When Safeway wanted to move from downtown, the family built the Pacific store in the 1960s and leased it to the company. In 1999, Safeway closed the Albany store and moved to 14th Avenue, but it retained its lease and kept making monthly payments until about two years ago. I checked with Lynn Kampfer, one of the principals in the Kampfer Family Limited Partnership, based in the Harrisburg area. He told me that yes, the family had taken the property off the market and was negotiating with a prospective tenant to get a new business into the building. He expected that something would be nailed down within a month. The building needs some work, he told me, and that will have to be done as well. And then there’s the permitting process with the city to go through. The “for lease” sign, seen here in January 2016, is now gone. Ahhh. Free enterprise at work. We’ll eventually see what’s cooking. For the short-termers — where was Safeway downtown? Could it of been in the old grocery store where the new city hall now sets? The Downtown Safeway was torn down to build the current City Hall. The glossing over is, what motivated Safeway to continue paying rent from 1999 until “…about two years ago.” And why did Safeway feel free to discontinue payments? Glossing over is perhaps too harsh. More likely, there is a juicy story behind the initial statements. Mr. Hering is a one-man band, riding a bike. We applaud Hasso’s efforts. We wish more could be done. Wondered what you meant by “maneuver,” searched for “albertsons albany oregon” (without the quotes), found a Safeway store locator on albertsons.com, so I guess they’ve merged. Also found a D-H article from 2014-01-13, chopped quotes: “””The Albany Albertsons grocery store, 1177 Waverly Drive S.E., will close on Feb. 20, […] store was unprofitable. 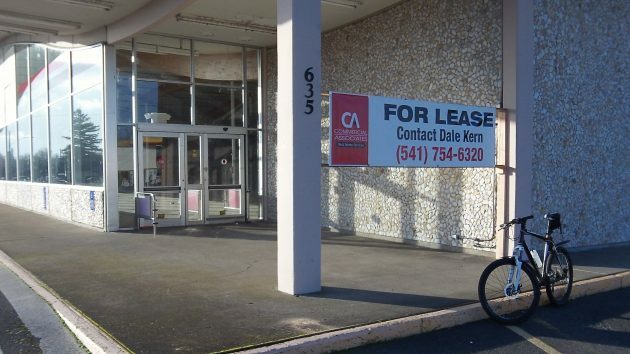 “We were just not able to impede the market place and move sales.” “”” Also, the Corvallis store closed in 2012. No kidding, unprofitable. In Corvallis, Albertsons was just a couple blocks from Winco. Their prices were even higher than Safeway’s. They played awful country music. It was almost empty all the time. I just didn’t feel like signing-up for their whatever-card to get better deals on a very few useful sale items, though I miss their pharmacy. I have no use for Safeway (3 Corvallis stores), either. The place looks just right for a bowling alley and big arcade combination. I suggested a hip mortuary, one using ecologically sound Swedish burial practices as a tenant, but Hasso censored my post. Maybe a liquor store too! Bowling alley and arcade is perfect – already looks like one. No need to disguise the retro-midcentury look for a midcentury activity. Then you could take that huge parking lot and do something useful with it. From aerial photo it looks like 126 marked spaces + the blank south corner + more space in the back not needed to maneuver large trucks = maybe 140 spaces, which doesn’t seem like that many after all. Oh well, obsolete midcentury transportation. One more interesting note on Kampfer history: Marie Kampfer (Lynn’s mother) was the first female on a hospital board in Oregon that was not a nun. She was asked by Marge Sexton, the hospital superintendent, to join the board after World War II. Mrs. Kampfer and her husband were solid supporters of Albany and Albany’s community hospital. These days every time I see the old store I think of the “Flying Nun”! But when I lived down the block we shopped there regularly. It sure would be nice to have a grocery store on the west side.. I thought the downtown City Hall was built where the Elks building was? When we moved to town in 1971, I remember Safeway ,at that time, was located in the building currently occupied by Big 5. Memory tricks perhaps, but I also remember a Safeway store next to the Pay-N-Pak which is where Big 5 and St. Vinny’s is today. Safeway operated two stores simultaneously in Albany for a few years, apparently. The “downtown Safeway” was indeed on the east side of Broadway with the north side adjacent to 3rd. There was an alley on the south side and the old Elks lodge building was between this alley and 4th. The Elks owned the entire one half block facing on 4th, the east half of the block was their parking lot. This is one of the best preserved examples of “Marina With Wings” MCM Safeway Architecture left in the state. I love the look of the iconic Safeway buildings. The style was distinguishing and inviting. It’s fun to see the few that are left here and there. I also love driving past the tiny, vintage McDonald’s on Powell in Portland. It still has the original golden arches and sits in the parking lot of a modern location.